What’s the secret to landing a new job when you’ve been out of work a long time? A new report by the AARP Public Policy Instituteuncovered some surprising strategies that older workers are using to get back into the workforce. That’s important because, while the job market is significantly better overall, the situation is still dismal for the long-term unemployed. The jobless rate for people out of work six months or longer is 30% vs. 5.5% overall. Older workers make up a distressingly large portion of that group: 45% of job seekers 55 and older have been looking for work for six months or longer. The AARP report examined the job search strategies that led to reemployment for people age 45 to 70 who were unemployed some time during the last five years. It found big differences in job search strategies between older workers who landed jobs and those who are still not working. The overall picture is mixed: Among those older workers employed again after a long time out of the workforce, some were earning more, getting better benefits, and working under better conditions. But for many, the jobs were not as good as the ones they had lost: 59% of long-term unemployed older workers made less money, while 15% earned the same and 25% made more. So, what set the successful job seekers apart? These moves stand out. Embrace change. Almost two-thirds of reemployed older workers found jobs in an entirely new occupation and women were more likely to find work in a new field than men. Of course, some of the unemployed didn’t choose to switch occupations. But for others, the change was a decision to do work that was more personally rewarding and interesting or even less stressful with fewer hours. Whether it was by choice or design, broadening your job search may pay off. Go direct. Older reemployed workers were much more likely—48% vs. 37% of those still looking for work—to contact employers directly about jobs instead of just applying to the black hole of online job postings. Network strategically. Everyone knows that networking is the best way to get a new job but apparently talking to everyone you know may not be the most effective method. While half of those who landed a new job reached out to their network for leads, only 34% of the unemployed used personal contacts at all. But the reemployed were less likely to rely on friends and family to find out about job opportunities, focusing instead on professional contacts. Move fast. When hit with a job loss, many people use it as a time to take a break or think about what they want to do next. That lost time can cost you. The reemployed were much more likely to have begun their job search immediately or even before their job ended than those who are still unemployed. A couple other surprising findings about what works and what doesn’t: Conventional advice is that the long-term unemployed need to keep their skills up to date if they are jobless for a while. While that can certainly help, additional training didn’t make much difference between those who landed a job and those who remained out of work. As for social media: While 56% of the reemployed found job boards a good source of job leads, just 13% said online social media networks such as LinkedIn and Facebook were effective in helping them get a new job. Among the most ineffective strategies: Using a job coach, talking with a headhunter, and consulting a professional association. The Abbott government is considering limiting wealthy retirees’ eligibility to the part-pension as an alternative to its controversial budget policy to cut the rate of pension increases, the social services minister, Scott Morrison, has said. Morrison signalled the potential backdown after the government faced nearly a year of internal and external criticism for its decision to confine pension increases to the consumer price index from 2017. Groups including the Australian Council of Social Service (Acoss) have repeatedly argued the original budget measure would erode the value of the pension relative to wages over time, and the government should instead consider tightening eligibility rules for the part-pension. Morrison said he would “consider seriously” the Acoss proposal because the government was “wedded to the goal” of a sustainable and adequate pension system rather than any particular measure. The chief executive of Acoss, Cassandra Goldie, said the plan to target the pension to those who most needed it would involve “reducing the current threshold that allows couples with as much as $1.1m in assets on top of the family home to qualify for a part-pension”. Goldie spelled out her alternative proposals in a statement issued on Wednesday. Acoss proposed reducing the cut-out point for the part-pension for couples to $794,250 in assets besides the family home, saving the government an estimated $1.45bn in 2016-17. Morrison signalled his openness to the plan. He said he had asked the sector and crossbench senators “if they have better proposals to make our pension sustainable”, and he would “keep on the table measures until there are new measures to put on the table”. “What I am saying particularly in relation to the pension is that the proposal put forward by Acoss today is something we will consider seriously. I am interested in getting an outcome and a solution here that delivers a sustainable pension for all Australians, not just those today but those in the future,” Morrison said in Adelaide. Morrison said the government was aiming to “get to a point where we can be in agreement about the measures that will deliver a sustainable pension”. The opposition leader, Bill Shorten, refused to say whether he would support the proposed changes to the pension asset test. “I’m not going to give this government a blank cheque,” Shorten told the ABC on Thursday. Shorten said there was still no concrete proposal on the table, but the government appeared to finally be admitting problems with its pre-existing policy to cut pension indexation. “Labor has always been up for making sure that we have the fairest possible system, but pensioners of Australia should not have to consider the Abbott government’s budget measures with a gun to their head which is cuts to $80 a week in pension indexation,” he said. Labor’s families spokeswoman, Jenny Macklin, said the government “should put carefully considered proposals to the public and then we can all look at them in a proper way”. “This review should include looking as the assets test and changes to super concessions,” she said. The pension indexation changes were announced in the government’s first budget, delivered in May last year, but faced a Senate obstacle. Morrison has been signalling for some time that he was looking at the pension issue. He recently proposed reviewing the adequacy of the pension every three years in an attempt to win crossbench support for the indexation changes. Morrison said community and seniors’ groups and the independent senator Nick Xenophon had offered constructive alternatives in what he described as a “coalition of ideas”. He said the government would “work through these measures in careful detail and seek to cost them fully”. JOYLEEN Thomas’s career began at 42, after she spent two decades out of the paid workforce to raise her family. Now approaching 74, Mrs Thomas has worked from the “bottom of the rung” to become the oldest full-time worker of 2000 employees at aged care provider ACH Group and has no plans to retire. 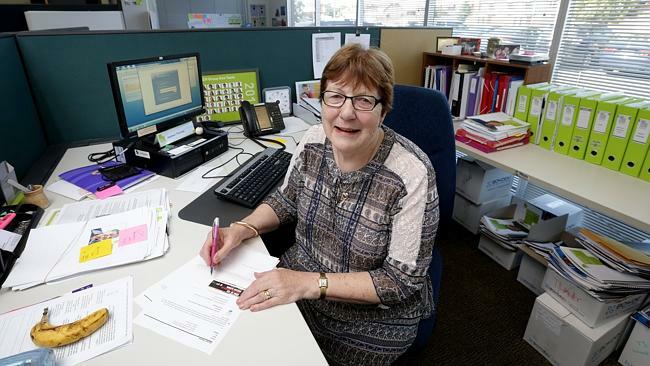 Part of her job at ACH’s Adelaide headquarters is to evaluate programs to improve the quality of life of aged care residents. “I have no idea when I will give up work … quite a lot of people I know have left and then come back into the workforce. My ­husband is an accountant; he works two days a week and he’s older than me,’’ she said. Mrs Thomas said although her husband had experienced ageism when seeking work after an initial retirement at 67, she had felt no pressure to retire from her role. Although the Intergenerational Report projects Australians over 65 will increase workforce participation this year, reaching 17.3 per cent in 2054-55, finding a job at an advanced age was proving difficult, said Mark Henley, advocacy manager for ­financial counselling and community support service Uniting Communities. He said financial pressures were forcing more older people back to work beyond retirement. “We see more older people wanting and needing work ­because they can’t afford to retire. Jobs for older people is more the issue we see,’’ he said. Council on the Ageing South Australian chief executive Jane Mussared said the report’s aim to increase Australians’ longevity and health should be celebrated. “But we also need to increase the opportunities for older people to stay in and, in many cases, get back into, the workforce,’’ she said. Although work participation rates are expected to fall by 2.2 per cent to 62.4 per cent by 2055, Ms Mussared said the participation rate of people aged over 55 was climbing slowly climbing. Assistant Employment Luke Hartsuyker says local employers need to start seeing the value of older workers. The Federal Government’s Intergenerational Report, released yesterday, found people will need to retire much later in decades ahead due to the ageing population. Just 13 percent of people aged over 65 are currently working or looking for work. Mr Hartsuyker said those numbers are going to have to rise, as people continue to live much longer lives. 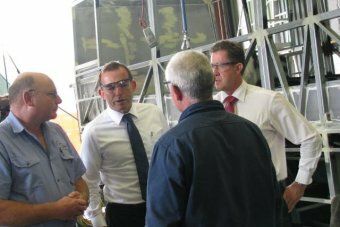 The Cowper MP said employers also have a role to play, in placing more trust in older workers. “I think it’s important that employers actively look for the benefits that older workers can bring,” he said. “The Government has a role to play in providing incentives, where appropriate – that’s an important step. Mr Hartsuyker said the future of the nation’s economy depends on people working much later into their lives. It’s well and truly time to start thinking about how to make older workers feel welcome, experts say. “Let’s get over our shock that older workers are going to be there longer and now ask the question about how can we make that useful and productive for everyone,” University of South Australia human resource management research professor Carol Kulik says. The experts have some tips for both older workers and employers. It’s going to be tough, it’s difficult, but the key thing is to keep at it,” says Greg Goudie, executive director of South Australian employment service DOME (Don’t Overlook Mature Expertise). “They’ve got so much to offer. They probably don’t know how much they do have to offer,” Kronos Australia and New Zealand managing director Peter Harte says. He advises learning how to write a resume and remarket yourself. Mr Goudie says older workers shouldn’t be afraid to knock on doors, as 80 per cent of jobs that are filled are never advertised. Mature-age people do have work experience skills, even if it’s stating that you’re able to work in a group with other people. “A lot of employers hold that in high regard,” Mr Goudie says. Skilled workers have a greater chance of staying in the workforce than unskilled workers, Mr Harte says. He advises learning a different type of skill and make sure employers know they can be very flexible. A lot of people who get to 50 and 55 and are out of work for a year can think it’s all too hard and `I’ll just give it up”, Mr Goudie says. The federal government’s restart program – offering a $10,000 incentive to hire and retain job seekers aged 50 and over who’ve been receiving income support – may be counterproductive, Edith Cowan University psychology discipline leader Dr Eyal Gringart says. Organisations don’t signal a very strong openness to older job applicants, Prof Kulik says. Their websites can have photos of bright, shiny young people and talk about fun and high-energy environments. Mature-age workers in organisations that adopt specific mature-age practices report high levels of engagement, Prof Kulik says. The practices can be to help older workers upskill, having alternative career paths so an employee can move into phased retirement, take on a new work assignment or mentor junior people. Organisations haven’t thought much about what kind of flexibility older workers need, Prof Kulik says. It’s not start times or which days they work. It’s opportunities to take extended leaves of absence if they have to for health reasons or alternatively to travel, while maintaining their job security. Professionals and managers tend to have more flexibility and autonomy, Prof Kulik says. It’s not as clear what will happen for people with physically demanding jobs such as construction workers, miners and plumbers if flexibility isn’t offered, she says. More companies are recognizing the value of mature workers—and they’re starting to hire them. Things are finally looking up for older workers. The latest data show the unemployment rate for those over age 55 stands at just 4.1%, compared with 5.7% for the total population and a steep 18.8% for teens. The ranks of the long-term unemployed, which ballooned during the recession as mature workers lost their jobs, are coming down. Age-discrimination charges have fallen for six consecutive years. And now, as the job market lurches back to life, more companies are wooing the silver set with formal retraining programs. This is not to say that older workers have it easy. Overall, the long-term unemployment rate remains stubbornly high—31.5%. And even though age-discrimination charges have declined they remain at peak pre-recession levels. Meanwhile, critics note that some corporate re-entry programs are not a great deal, paying little or no salary and distracting workers from seeking full-time gainful employment. Still, the big picture is one of improving opportunity for workers past age 50. That’s welcome news for many reasons, not least is that those who lose their job past age 58 are at greater health risk and, on average, lose three years of life expectancy. Meanwhile, older workers are a bigger piece of the labor force. Two decades ago, less than a third of people age 55 and over were employed or looking for work. Today, the share is 40%, according to the St. Louis Federal Reserve. AARP and others have long argued that older workers are reliable, flexible, experienced and possess valuable institutional knowledge. Increasingly, employers seem to want these traits. This spring, the global bank Barclays will expand its apprenticeship program and begin looking at candidates past age 50. The bank will consider mature workers from unrelated fields, saying the only experience they need is practical experience. The bank says this is no PR stunt; it values older workers who have life experience and can better relate to customers seeking a mortgage or auto loan. With training, the bank believes they would make good, full-time, fairly compensated loan officers. Already, Barclays has a team of tech-savvy older workers in place to help mature customers with online banking. The new apprenticeship program builds on this effort to capitalize on the life skills of experienced employees. Others have tiptoed into this space. Goldman Sachs started a “returnship” in the throes of the recession. But the program is only a 10-week retraining exercise, with competitive pay, and highly selective. About 2% of applicants get accepted. It is not designed as a gateway to full-time employment at Goldman, though some older interns end up with job offers at the bank. The nonprofit Encore.com offers mature workers a one-yearfellowship, typically in a professional capacity at another nonprofit, to help mature workers re-enter the job market. Again, this is a temporary arrangement and pays just $25,000. But a growing number of organizations—the National Institutes of Health, Stanley Consultants, and Michelin North America, amongmany others—embrace a seasoned workforce and have programs designed to attract and keep workers past 50. Companies with internship programs for older workers include PwC, Regeneron, Harvard Business School, MetLife and McKinsey. We all understand the population is ageing, and while comments by treasurer Joe Hockey that the first person to live to 150 may have already been born attracted some derision, it should come as no surprise. What is less easy to understand is the curious paradox that, as the workforce ages, the age at which workers are being labelled by organisations and recruiters as “old” is getting younger. The way that many organisations and those recruiting for organisations construct old age is very different to the way that the authors of the soon-to-be-released Intergenerational Report are likely to construct older age. Our research into the management of age in organisations has found overwhelmingly that employees over the age of 45 self-identify as older. Further, there is a general sense amongst organisational decision makers that if you haven’t “made it” by the age of 40 you aren’t going to “make it” at all. Declaring that you must have made it by 40 not only ignores the huge potential of people in their 50s, 60s and 70s, but it also doesn’t account for the fact that many women and men are ready to hit their stride in their 50s. Relieved of the heavy lifting responsibilities of parenting, they are able to devote themselves to their careers and to their employers. Some companies have managed to see this potential and are beginning to think creatively about what having an older workforce profile means and how they can leverage its opportunities for increased productivity and innovation. The advent of the corporation in the early and mid-twentieth century created a prototypical career/life cycle in which youth meant education, adulthood meant work and old age meant retirement. This may have served bureaucratic corporations of the past because it provided order and calculability to those who passed through it. However, it is an out-dated way of thinking for the modern corporation Much of the discourse in the lead-up to the release of the Intergenerational Report pits old against young. Older people are constructed as an economic burden and younger people as resentful and angry. Yet our research into intergenerational relations in organisations found high levels of respect between younger and older people. In particular, we found that younger employees greatly respected the knowledge and resilience that their older co-workers brought to their work. As the workforce ages and people stay in work longer, there is a huge opportunity to capitalise on the diversity of ideas, customer segments and product markets that an intergenerational workforce can open up to an organisation. Our research with a global engineering firm showed that the most innovative divisions were the ones in which teams were configured to include a broad range of ages, from new graduates to experienced workers over the age of 65. Respondents reporting learning from one another, and the shared experience flowed both ways. In these teams, the notion of experience wasn’t limited to time served, nor was it seen to expire once people had reached a certain age. Words do matter. The way that we talk about age in organisations affects both internal employee engagement and also recruitment strategies. Those older and younger than the magic age of 35 to 45 often receive an unintended but powerful message that they have less to contribute to the organisation, and report lower levels of workplace engagement as a result. The language organisations use in their general marketing and specifically in their recruitment can send unintended signals that those over 45 need not apply. One organisation we worked with wanted to recruit people 45 and older but was having trouble attracting candidates. We could show them that the wording of their job advertisements, “join a vibrant team that works hard and plays hard” and “working space is fresh and funky” was unintentionally signalling that older candidates were not welcome. We encouraged them to highlight aspects of the job that are most important to older workers: recognition of skills, work and life experience; the culture and values of the organisation; and the opportunity to learn new things. This last one is important because it is perhaps the most pervasive yet blatantly false stereotype about ageing. We don’t stop wanting to learn new things as we age. If the fourth Intergenerational Report is to have the impact that the government, policy makers and employees of all ages are hoping it will, then it is business that needs to take the lead in re-imagining careers, shifting to an age-inclusive culture and establishing the organisational structures whereby employees of all generations can work with, for and alongside one another. Our prosperity and productivity as a nation relies on it. You’ll have seen loads of ‘New Year, New You’ stories by now – do this, stop doing that, buy a different shampoo and you’ll look years younger, feel heaps better and be far more attractive. The most consistent message seems to be that the appearance of youth is the key to success. Even for men, who traditionally have a longer shelf life than women, being young (or at least appearing to be) has enormous cachet. There are plenty of ways to pass yourself off as a younger feller – new haircuts, plastic surgery, a spot of Botox, maybe getting rid of that unsightly beard. Best of all, try losing a few kilos – chiselled is always better than jowly. But have you tried this? It’s simple and, while not entirely foolproof, it’s certainly guaranteed to bring results. What is it? Lie about your age. Until quite recently whenever I mentioned how old I was, the response would be something along the lines of “No, really, you don’t look it”, “My God you are not” etc. So imagine my surprise when I told someone my real age and their response was … “Oh yeah”. My face had caught up with my birth certificate, something needed to be done, and the simplest thing was to rewind the clock. It’s as easy as that. Now if anyone asks my birthday I give my wife’s. And just like that I’m six years younger. What’s wrong with that? It’s not like I’m trying to commit identity fraud. I’m not passing myself off as anyone else, just lopping 70 months off my age. It obviously doesn’t work with banks or insurance companies which, annoyingly, want to know my actual birthday “for security purposes”. It probably won’t fool HR when the grim reaper of redundancy next passes through the office, either. Everyone else will have no choice but to believe it. And more people are doing it than you might think. I recently read a story about someone I’d interviewed a few years back and smelt a rat. A quick look back through the clippings file revealed that he, too, had at some point been a bit elastic with his age. And good for him. My sister admitted to me the other day that she’s been doing it for years and claims her partner’s birthday as her own now and again. She has to remember his star sign and act the part when she does but otherwise, she says, it’s a big success. But can you get away with it? Pick a new birth year – and stick to it. Maybe keep the same birthday. You might have to bone up on kids’ TV or pop songs from your purportedly formative years. I’m luckier – an accent that identifies I’m not from around here gives me a degree of vagueness about these things. Don’t lop too much off, either – ideally, no more than 10 per cent of your real age. I don’t think it’s a big deal. You are, after all, only as old as you feel. And if you feel like being a bit younger what’s to stop you? Go on, give it a whirl. 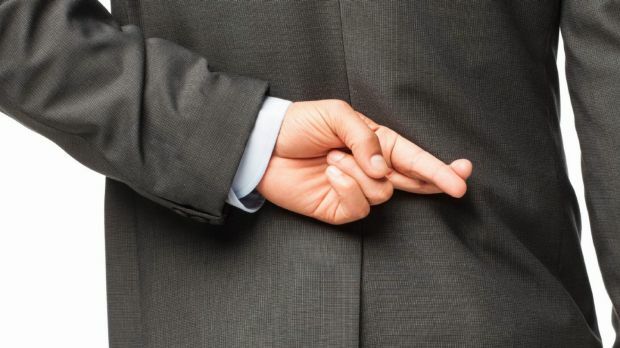 Is your age set in stone or do you tell the odd white lie? (Bloomberg) — Everyone calls her Auntie Helen. At 69, she’s one of the oldest employees at the food court at Raffles Place in Singapore, where office workers grab sandwiches and bowls of soba noodles in the lunchtime rush. As she cleans and stacks cutlery, Helen Wong might seem to represent the workforce of the city’s past. For a government grappling with an aging population, rising costs and curbs on immigration, her generation is the future. In a culture that traditionally expects children to look after elderly parents, Singapore’s employment rate for those between ages 55 and 64 is now 66 percent, among the highest of the 34 nations in the Organization for Economic Co-operation and Development. The government has made it mandatory for companies to offer three more years of work to those turning 62, the official retirement age, and plans to extend that to five years by 2017. The trend in Singapore is a microcosm of what’s happening across much of the developed world as families shrink and people live longer, increasing the strain on government pension systems. South Korea, with the fastest-aging population in the OECD, told employers to provide retirement plans for staff starting in 2016 after realizing that its state pension fund may go broke by 2060, when its population over 65 is set to triple. Germany and the U.K. plan to raise their retirement ages to 67 from 65, while Australian Treasurer Joe Hockey wants to increase the threshold to 70, the highest in the world. Singapore has gone a step further. Rather than simply extending the working age, the government is encouraging companies to bring retirees back into the workforce. New registrations by those over 60 at state-run career centers, which help find jobs and retrain workers, almost doubled to 4,799 in 2013, from 2,494 in 2008. The push to hire older workers follows an attempt to increase the population by as much as 25 percent by 2030 through immigration, a policy that prompted a public backlash as the arrival of migrants pushed up property prices and strained public transport. More than 40 percent of the country’s population was born abroad. 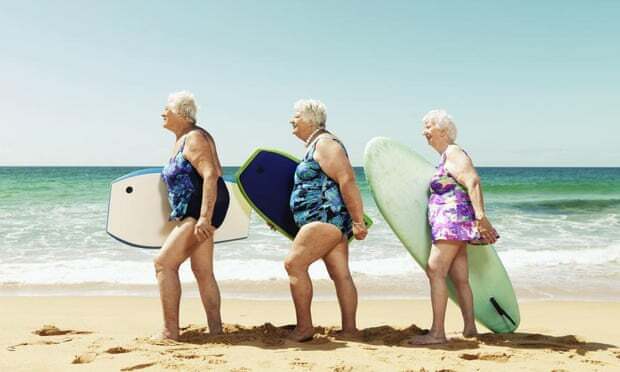 To help address the labor shortfall, a committee for the employability of older workers unveiled an advertising campaign last year showcasing a 65-year-old lifeguard, a 76-year-old assistant inventory manager and a 60-year-old salmon filleter. “Tap Into a Wealth of Experience,” exhorted an ad plastered across the side of a bus driving through the central shopping district, featuring a 58-year-old assistant front office manager at Raffles Hotel. “Given the tight labor market situation, you actually would find many employers coming forward to say they’re willing to hire older workers,” Senior Minister of State for Manpower Amy Khor said in parliament in September. Older workers have found jobs in companies including Hotel Royal Plaza on Scotts, Singapore General Hospital Pte. and ComfortDelGro Corp., which runs the island’s biggest taxi service, according to the committee. The government in 2012 raised the age limit for taxi drivers to 75 from 73. Singapore offsets part of the costs of hiring elderly workers and companies can tap government funds to redesign jobs and human resource systems for them. Older employees are especially useful for lower-skilled positions that otherwise might not be filled, said Leong at Barclays. Cleaners, laborers and production and transport operators accounted for the highest numbers of older workers, according to a survey last year by Singapore-based DBS Bank Ltd. A majority of the elderly who were employed drew gross monthly incomes of less than S$1,500 ($1,124), it showed. About one-fifth of Singapore’s employees over 55 work part time, such as Margaret Lee, who retrained after retiring from a childcare center and now works two days a week at a school cafeteria. “It gives me something useful to do, and some extra money to spend,” said Lee, 62, whose husband is retired. Working part time allows her to help look after her grandchildren while their parents are at work. By 2020, more than a third of Singapore’s population will be over 50, and by 2050 the nation’s median age will be 54, according to the committee on older workers, which includes representatives from government, business and trade unions. “It has become essential to hire older workers because of the aging population,” said Angelina Toh, co-founder of AJA Enterprises Pte, which adapts buildings to withstand bomb blasts. She said her company employs them in supervisory and marketing roles where they adjust better than foreign workers. “They’re more mature emotionally, more independent,” Toh said. Singaporean men live more than 20 years beyond the official retirement age on average and women 25 years, the longest out of the 68 countries in the Global Sunset Index released by Bloomberg Rankings in 2013. While retirees can draw from their pension savings at 55, at least S$155,000 must be kept in the account to provide a steady income stream. Only one in five Singapore investors is confident their pension accounts will meet their retirement needs, with 47 percent indicating the savings will be insufficient, according to a survey released in August by Toronto-based insurer Manulife Financial Corp.
Auntie Helen says the money from her job in the food court covers her daily expenses and she enjoys chatting with her younger colleagues.